Eversource technicians work on lines in early December 2018 in Norwalk, Conn. The costs Connecticut customers pay for the generation of the electricity they use will rise 19 percent or 24 percent on average in the first half of next year for households and businesses enrolled by default with one of the two major utilities operating in the state. As of January, the “standard service” generation rate offered by Eversource will increase to 10.14 cents a kilowatt hour or $76 a month on average — from the current 8.53 cents — for a hike of $12 monthly, or 18.9 percent, according to the Connecticut Department of Consumer Protection. Avangrid’s electric generation rate will increase 24.1 percent to 11.23 cents a kilowatt hour, an increase of more than $16 monthly on average. With dual headquarters in Hartford and Boston, Eversource provides service in nearly 150 Connecticut municipalities, including Stamford, Danbury and much of the southwestern section of the state. 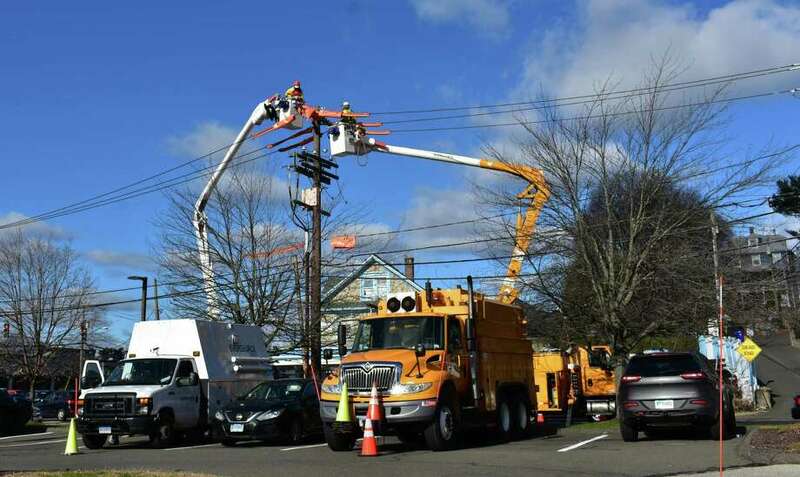 The company reported a 21 percent increase in third-quarter expenses it incurred to purchase and transmit power to Connecticut customers, while still achieving a 4 percent increase in profits from a year earlier to $100.3 million. Avangrid is based in Orange, with territories including Bridgeport, New Haven and surrounding towns. The company similarly reported increased costs for energy and an overall 26 percent increase in earnings for the third quarter to $125 million, including profits from its Connecticut Natural Gas and Southern Connecticut Gas divisions. The utilities and the state maintain comparative rates on the Energize CT website at www.energizect.com, with call center representatives available at 1-877-947-3873 to help people weigh their options. Of alternative providers that do not charge monthly fees or extra charges for enrollment or cancellation of service, Direct Energy offers the best rate at present in Eversource’s service territories, at $9.39 cents a kilowatt hour, amounting to a savings of $5.64 on average monthly from standard service from Eversource. Starion Energy is currently tops for Avangrid alternatives that do not tack on extra fees, at just under 10 cents for a monthly savings of $9.27, on average. Several programs offer fixed rates well above that of standard service from Eversource and Avangrid, with the Department of Consumer Protection maintaining an ongoing list of providers as well that have variable rates on beyond standard service. The DCP advises homeowners and businesses to ask questions in advance of signing up for variable-rate contracts, to include the length of any contract, whether it will renew automatically and how much notice is required to switch back to standard service. And the department advises people to handle door-to-door salespeople by asking to see identification and for a telephone number to call to sign up, rather than signing any on-the-spot contract.